Livefyre has launched a new version of its Storify social content service, marking its biggest update since acquiring the company a year ago. With the launch, Storify has rebranded its VIP service as Storify Enterprise and included real-time collaboration features. 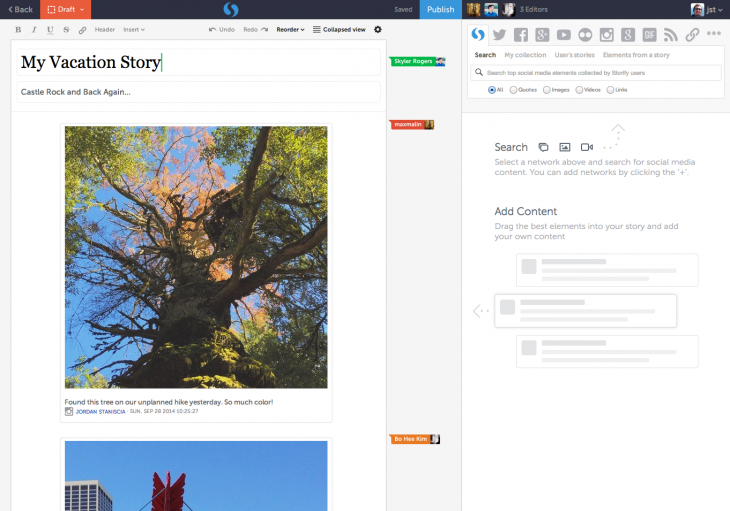 Multiple enterprise users will now be able to work on the same story simultaneously and see who’s making changes. The service also now has an autosave feature active for every keystroke. Additional Storify Enterprise features include undo and redo support, private stories, unrestricted API access, real-time updates for readers, SEO and Google Analytics support. Non-enterprise customers will also find a redesigned story editor with autosave, undo/redo, timestamped updates, anchored links to specific items, Facebook Pages integration and Export-to-PDF.